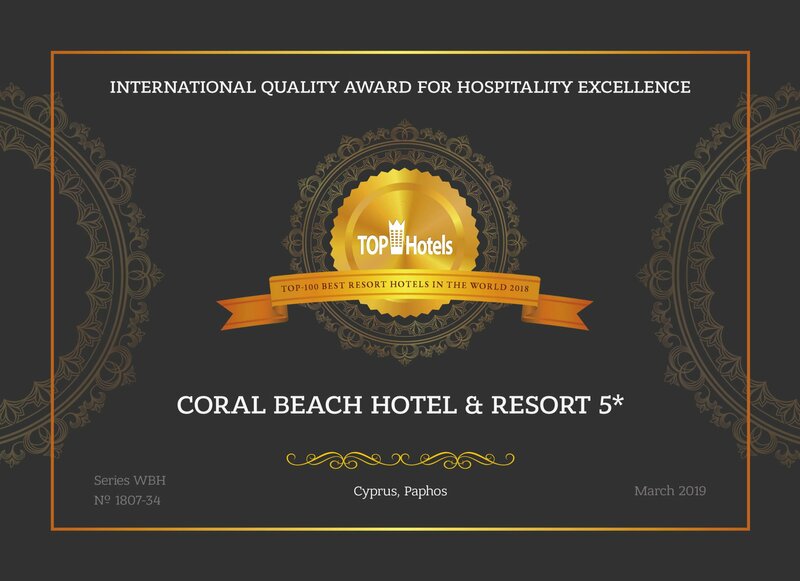 Calypso Hotels and Resorts are delighted to announce that Coral Beach Hotel and Resorts in Paphos – Cyprus has been awarded with the International Quality Award for Hospitality Excellence as one of the Top-100 Best Resort Hotels in the World for 2018 . The International Hotel Awards are the International 5-Star standard of hotel- ratings. The International Hotel Awards global competition determines the finest hotels and hospitality companies in the world. The 5-Star Coral Beach Hotel and Resort with 421 rooms and suites, its unique architecture with lush landscaped gardens along with the personal service and cuisine second to none, offers events to the most discrerning quest, anything expected from a World Class Hotel. The hotel is spread around a beautiful curving bay with a white 500 meters sandy beach and a picturesque fishing harbour, amphitheatre ,supplemented with some of the finest spa and sport facilities in Cyprus.